Nypave FX 25 PL is a specially designed binder for mixtures characteristic by a high moduls of rigidity (HMR, French class EME), produced in accordance with EN 12591 and Nynas quality specifications. In view of the projected intense traffic flows, with a high proportion of heavy vehicles, an asphaltic concrete pavement characterised by a high modulus of rigidity (HMR, French class EME) was specified, using Nypave FX25 PL bitumen binder. This binder is from the Nynas Performance Programme's 'Extra' range, specially designed for mixtures of high modulus of rigidity. The design of a pavement characterised by a high modulus of rigidity (HMR) is intended to provide base and binder courses of asphaltic concrete with exceptional qualities of load bearing, longevity and resistance to deformation. Also of resistance to thermal and fatigue cracking. A mix of asphaltic concrete was designed based on 0 - 16mm crushed basalt stone aggregate plus Nypave 25XPL binder, to ensure that the high parameters of the specification were met. The pavement comprises a binder course of 80mm above a 120mm thick base course. With noise limitation in mind, a 30mm thin layer surface course of stone mastic asphalt (SMA) was applied, containing Nypol 86. Compaction was carried out using two vibratory steel rollers of 10 and 8t respectively. The chosen solution (to use a pavement of high modulus of rigidity) meant that the base and binder courses could be reduced from the traditional 250mm thickness to 200 mm; while maintaining high load bearing capability, durability and longevity, plus resistance to surface cracking. 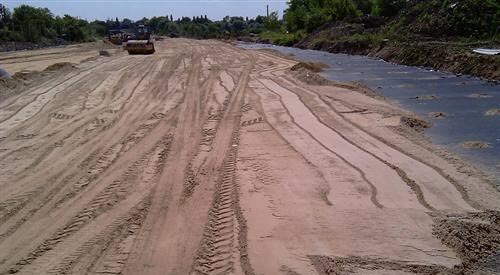 Download this information on how Nypave FX 25 PL was used at New Road, Poland, as pdf.